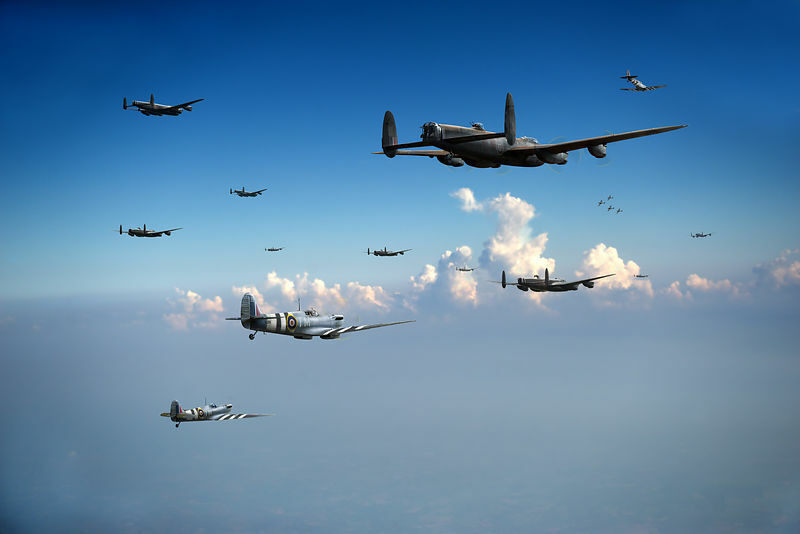 The sight of Spitfires escorting Lancasters - and in daylight - might seem highly unusual but operations like this were part of the massive Allied air effort against German forces after D-Day in 1944. Here is an article I wrote about it: http://www.aerialcombat.co.uk/2014/11/spitfires-escorting-lancasters-in-daylight.html. This was one of four of my pictures that appeared - as a double-page spread in this case - in a Classic Magazines special 'bookazine' about the RAF involvement in the Allied invasion of Europe, published by Mortons to mark the 70th anniversary. I had some great feedback from the editor, who wrote to say he had been discussing the pictures with a former Spitfire pilot, now in his 90s. "He commented in particular on your image of the Lancasters being escorted by Spitfires on a daylight raid. He said, he didn't understand how it [the picture] was done, but it was just like the real thing, as he has actually done it. I thought you might appreciate knowing the thoughts of someone who was once actually in the scene you have set – praise indeed."